#stampinup Teneale Williams is an Australian stamper and a member of Stampin' Up's 2014 Artisan Design Team. I had the honor of being on the Creation Station design team with Teneale. Her work is amazing. Really. Amazing. It's no wonder that she was chosen for the Stampin' Up Artisan Team. You should check out Teneale's blog! Teneale always inspires me and this card was so sweet and clean and simple that I knew I'd have to CASE it--well, use it for inspiration! I love the "Wild About Flowers" set--it can be used for any occasion. One of my friends hosted a birthday card stamp-a-stack earlier this month and I used Teneale's card and bag for inspiration. I changed the color scheme to Rose Red and added a Basic Black layer to my card--and some Basic Black banners. Here are the full details. I started with a Rose Red card base and added a Basic Black mat. 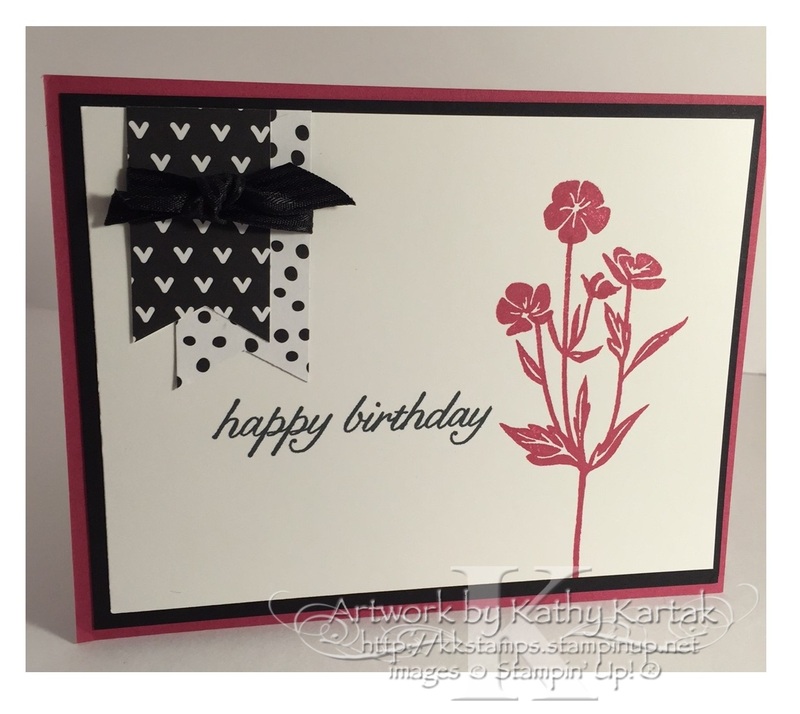 I stamped one of the flowers from the "Wild About Flowers" set in Rose Red onto a Whisper White Panel. Using my Stamp-a-Ma-Jig, I aligned the sentiment from the "Birthday Blossoms" set and stamped it in Memento Tuxedo Black. Next, I cut a 1" x 4" piece of Everyday Chic Designer Series Paper. I flagged both ends with the Hexagon Punch (you could use the new Banner Triple Punch) and then cut the strip of DSP in half. I aligned the two strips and wrapped them with a length of Basic Black Stitched Satin Ribbon and adhered the assembly to the card. I was pleased with the way I combined both of Teneale's elements into one card and still retained the simplicity of her design. I hope you'll check out Teneale's blog. I stop by there often because her designs are so inspiring! !